(GAMEWEEK 6) at Liberty Stadium, Swansea. SWANSEA - Pass. Pass. Pass. The predicted pattern of the late kick-off on Saturday afternoon which saw Arsenal pick up three points at the Liberty Stadium in a game of two very contrasting halves. With a lackluster first half, Arsenal would take the lead with two goals in the second half, only for the hosts to fire back one and result in a thrilling finish to the game. *This article is still being updated. Please refresh the page for more content. The Swans got the proceedings underway as the fans at the Liberty Stadium where poised to watch a showcase of excellent football. After some early pressure from Swansea on the Gunners, Dyer won the first corner kick of the game albeit leaving Szczęsny unfazed in front of goal. They restricted Arsenal early on, as they continued to pass the ball round the field and disabling Arsenal's ability to put together multiple passes early on. Former Liverpudlian Jonjo Shelvey fired at goal to get an early chance. It was teed up by numerous passes from the Swans and Shelvey chested it down for the shot, only to be fired over the bar. Swansea continued their early dictation of the game, with another corner of which was once again saved calmly by Szczęsny. Arsenal were not however under the threshold of Swansea's possession for too long, as they began to string together their passes in order to undermine the pressure, and had a chance on the break. Luke Gibbs made a promising run and passed it across the box only to a defender as no Arsenal attacker was present to put it past Vorm. Former Cardiff player Aaron Ramsey was subject to booos from the home crowd when he had early possession of the ball. Arsenal had another chance soon after, reverting back to their original and preferred style of passing the ball around the pitch. Mesut Ozil's ball to Giroud was intercepted, timely too, as it would have definitely troubled Vorm if it went through. 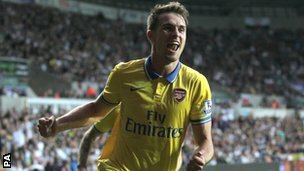 Two minutes later, Ramsey came close when his shot fizzed past the post, after Flamini set him up for the shot at goal. Swansea's pass-and-move strategy was clear as the 20 minute mark approached. Wilshere fouled in frustration giving the hosts a free-kick. Rather than walloping the ball into the box, Swansea continued to pass-and-move, pass-and-move, delightful stuff to watch. It looked like it would come into fruition at times, as a great pass from Flores sent Dyers through, but Gibbs would eradicate the danger for the time being. Arsenal were leaving the right flank exposed, allowing the Swans to utilize the space and attack. Arsenal could have conceded in the 32nd minute. Wojech Szczęsny came rushing out of goal to close down Michu, and the ball seemingly went out for a goal-kick. However, Michu passed it back into Routledge who shot across goal. The linesman had the flag up, but very late. Szczęsny looked far too composed there, taking a big chance. As half-time approached, Swansea looked really dominant. They had a full threshold in possession, and had Arsenal in dire straits. However, defense was staying put on both sides and chances were restricted. Although the passing was good to watch, the lack of attempts was becoming some what laborius. Neat, tidy possesion but not enough chances. Crowd quietened down a lot too. The players went into the break with it all even between Swansea City and Arsenal. Liberty Stadium had significantly quietened down. Plenty of nice possession, but not enough chances. In fact, zero shots on target in the first fourty-five minutes. Both teams started the second half unchanged, with Swansea once again putting the pressure on the visitors, but Gnabry came close on the break conceding a corner - which came to nothing. After 51 minutes of minuscule chances and passing, the first shot on target game. Serge Gnabry was playing his heart out (partially) and got a shot of goal that Vorm easily saved. Swansea got some work done on the break, but nothing materialized. Then, just minutes after the first shot on target. Serge Gnabry would score the first GOAL! of the game. He slotted it past Vorm in a calm and collected finish. Gnabry was looking like the only possible goalscorer, and he delivered on that promise. The goal was very uplifting for the team, who began to pick up and get more and more chances. Mesut Ozil's shot was just saved, and Arsenal pressed now having the Swans on the backfoot. The euphoria would come into fruition, again, as Aaron Ramsey's superb form would continue with another GOAL! four minutes after Gnabry opened the scoring. Szczęsny shifted the ball up to Ramsey, who flicked it onto Wilshere. Giroud's back-heel into the box set Ramsey up to hammer it into the back of the net. Swansea were not looking good contenders after the two goals, only able to put up a half-decent effort that was denied. More passing from the Swans, but nothing was coming into the quality needed to get back into the game. Just when we thought Swansea were down and out, created and then scored by Ben Davis. A GOAL! that made it into a real contest. With less than 10 minutes remaining, there was a real contest in the offing. The 90 minute mark approached. Arsenal remained in the lead with a goal ahead, and the fans were getting worried but fired up with four minutes of stoppage time. There was just a goal in it. With moments remaining, Swansea's free-kick came safely into the hands of Szczęsny. Another Arsenal clearance came back into Swansea possession, and a ball into the box went back into Szczęsny's hands. The final whistle blew and it was all over. Arsenal's win means that they have won every game since their opening day defeat. A game of two very contrasting halves, the first, passing and lackluster play, the second, a real thrilling fourty-five minutes. Young Gunner Serge Gnabry is Arsenal's hero, scoring the opening goal, meanwhile Aaron Ramsey has another superb performance. For Swansea, it is another story. Home performances have been lackluster and the fans may not be happy. Arsenal's three points men that they will end the gameweek topping the league. Match report, breakdown, analysis, talking points and more for Swansea City vs. Arsenal from the Barclays Premier League 2013/14 season. This game was played on Saturday 28 September 2013.